(May 27, 2014) — Fifteen UK faculty members will teach students at Shanghai University (SHU) in China for a week this summer through the UK Confucius Institute’s (UKCI) “UK Faculty China Short-Term Teaching Program,” during the week of June 16-20. 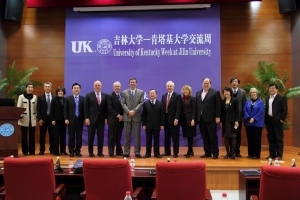 The program fosters global literacy throughout UK’s multiple disciplines by embedding UK faculty members in SHU’s departments where they teach students for one week, meet professional colleagues, identify shared research interests and gain key insights into China that they can then share with their students in Kentucky. Following the teaching week, UK Provost Christine Riordan, College of Arts & Sciences Dean Mark Kornbluh, College of Fine Arts Dean Michael Tick, Carvalho, and UKCI Director Huajing Maske will join the visiting UK faculty to celebrate “UK Week at SHU,” from June 23-27. During “UK Week at SHU” members of the UK delegation will give lectures providing Shanghai University faculty the opportunity to connect with UK’s disciplinary and academic expertise. The UK Confucius Institute held a similar “UK Week” at Jilin University in Spring 2012. Seven UK deans led by Interim Provost Tim Tracy spent five days at Jilin University giving academic talks, and meeting with their counterparts to discuss collaborative opportunities. The UK-JLU Collaborative Framework was established as a result of “UK Week” at Jilin University, which includes a 2+2 agreement and faculty exchange agreement with the Gatton College of Business and Economics; and a 4+2 agreement with the College of Public Health. Partnerships with UK’s Computer Science Department, College of Communication and Information and College of Arts & Sciences are still be negotiated. Ernest Yanarella, chair of the Department of Political Science, taught a course as part of the “UK Faculty China Short-Term Teaching Program” in 2012. The title of his course was, "Bridging Modernity, Globalization, and Sustainable Development in China and the West." "I must say that teaching in China to young Chinese college students was one of the most meaningful educational experiences I have had as a scholar and university professor," Yanarella said. "It proved to be a splendid opportunity for an American scholar and teacher to engage in a real dialogue with future leaders of the People's Republic of China." Yanarella said that such partnerships are a win-win situation for Chinese universities and UK. The opening ceremony and reception for “UK Week at SHU” will also be an opportunity to celebrate and connect with UK’s alumni in China. The event will be hosted by UKCI, the Office of China Initiatives and Shanghai University.